9-&GT;1 solve today skipping 7s to fill them last. 1:57. Hi Plum and Good Morning to all! Lake Effect snow decided to present us with a good 5 inches of snow. The weight of said snow is evidently too much for the trees that still have leaves because the top of the snow is littered with a thick carpet of leaves, mostly Oaks. I'm surprised there haven't been widespread outages from limb breakage and branches on power lines. I just got a new snowbrush yesterday and floor mats with deep plastic wells for containing snow and slush from boots. Not a moment too soon. The snow plows working the few main roads have scraped off the nice sticky snow and left the underlying crunchy ice. Almost as an apology they've scattered some dirt on the curves and a few stretches of roadway near swamps that have no shoulders or guard rails. That's exceptional road maintenance in rural Michigan. You gotta love winter to live here to be able to keep your sanity. If you don't you end up exhibiting strange behavior. Mine is writing gruesome descriptions about the conditions. So today I guess I'm thankful for words, and also for all the accoutrements and infrastructure that make winter somewhat more manageable. Chilly. Snowed again last night - a bit too early this season. Hope you are in a spot of sunshine! We're in a spot of sunshine, Shiela - BUT offset by a viciously frigid wind. Your Michigan snow graced us in the afternoon yesterday; thankfully the winds waited until that snow melted so we don't have trees toppling everywhere! I'm thankful for your words, too, Plum. What a great description! Hubby spent a great deal of time collecting/raking/blowing our leaves to the curb for pick up. Then the winds came. We are now sharing our fallen Fall foliage with the neighbors. I doubt they are pleased. VERY windy today! I just finished Wombat's poozle. Now to send my answers. Try it, it's a good one! I've just sent my answers too, Kathy! There are always some giggles when I near the end & start determining what I have left to use to create an answer - this time it was very hearty laughter! Morning all,pretty blue wren to brighten our day. Plum, great description of your area. 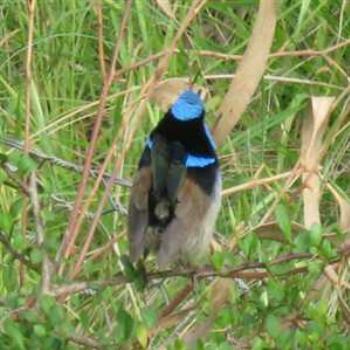 Lanky yank for the lovely photo of the beautiful blue Wren. Thanks for the '9-&GT;1 solve hint', Plum. One of my fastest, ever solves. I actually broke 3 minutes. 1:27. Good morning everyone after a late night - I went to watch 'We Will Rock You', what a fantastic show! I saw it about 13 years ago, enjoyed it far more this time. It is a lovely sunny day here. No wind (they usually spoil these spring days but not today). thank you for the jokes DoA. I have uploaded a few photos of my Great Grandson, Isaac, in my gallery. He is now 7 months old. I think the D side of DoA is dominating, today! He is as cute as a button, Queen Anne! Thanks for sharing! The US president did not participate in the commemoration of Armistice Day, presumably because of rainy weather preventing his plane from getting him there, although all other heads of state managed to attend. What's funny is that everyone initially assumed it was because it would be a bad hair day for him! Stop trying to (R)ock the boat Sarah....ya know the sun shines outta Trumps bum! At least the turkey has been plucked for Thanksgiving.